I’m making an unplanned stop at Marion after my food supplies ran low thanks to some pony banditry, but in truth I’m feeling a little relieved to have a day in town before hitting the trail again tomorrow. I got to spend the last week hiking with my mom! She came and met me at Mountain Harbor Hostel, easily my favorite hostel I’ve stayed at to date. We hiked together into Damascus, one of the most famous trail towns and home of Trail Days, which I may return to Damascus for in a couple weeks. If there is some Appalachian Trail god, then he smiled on my mom. While she was here we had gorgeous weather, long stretches of flat trail and a lot of spectacular and varied scenery. It rained twice, once when my mom decided to take a bit of a break while I slackpacked on my own, and once while we took a zero together in Damascus. 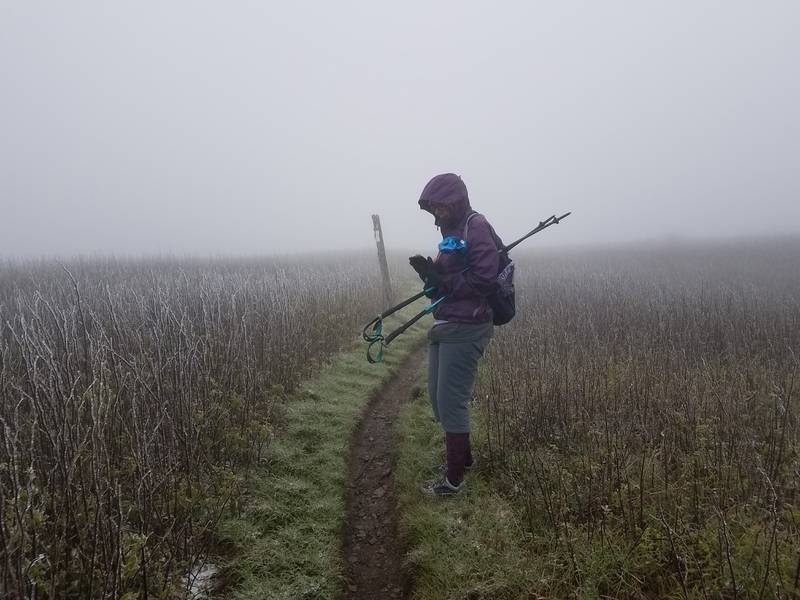 The minute she left it started pouring again, so what I’m saying is my mom needs to hike the Appalachian Trail all the time. It did admittedly snow during our last day together, which forced me to begrudgingly decide not to send my winter gear home with her. I reached the 400 mile mark with my mom by my side, entered into Virginia with her somewhere ahead of me, and passed the 500 mark with a couple of ponies. Gloriously sunny, perfect swimming weather coming out of Roan Mountain, ending in snow and some gross rain in the Grayson Highlands. I hope to migrate permanently to shorts soon. We started our hike with me several shades of cranky. I had walked out of the Smokies and thought I was done with the snow, unless some feels like popping out once I finally reach Maine. I had been planning on having my mom take my winter gear home with her and I had been fantasizing about how light my pack would be. Now I was going to have to hold onto it for longer and pay the postage to send it home. 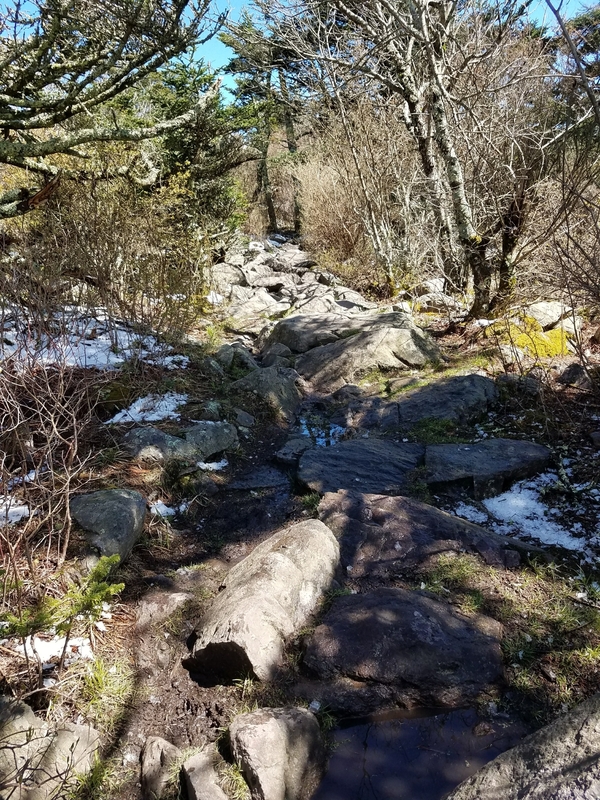 I was thinking about how soggy and gross the trail would be and how annoying walking with snowmelt dripping on you is. And more than anything, I just felt like I had been snowed on enough. But my mom was having a blast, taking pictures and experiencing that crazy on-top-of-a-bald wind for the first time. 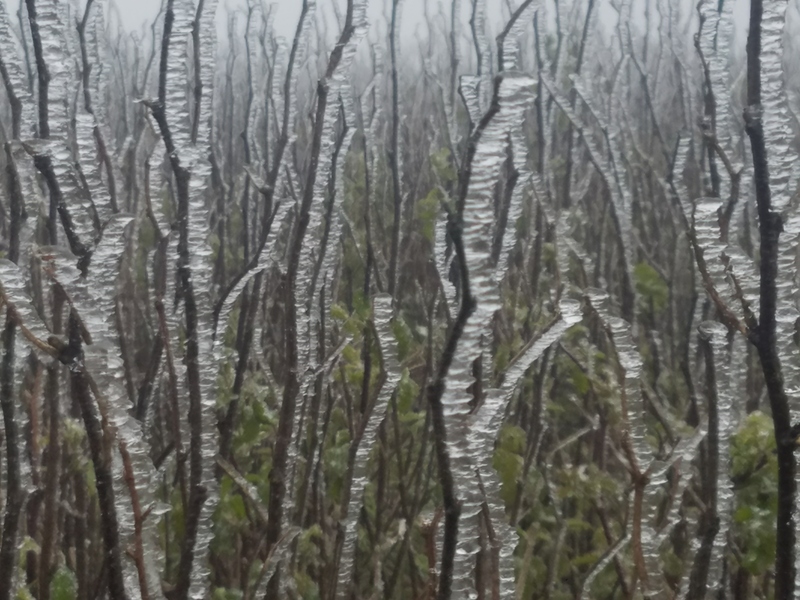 This had been new and cool and exciting for me too at one point, and I remembered how awestruck I was by the snow early on. A lot of people have been talking about how the honeymoon period is over and we’re just in it now, which is true. It was nice to watch someone still in the full flush of that honeymoon. My feet were battered and bruised at the end of each day. 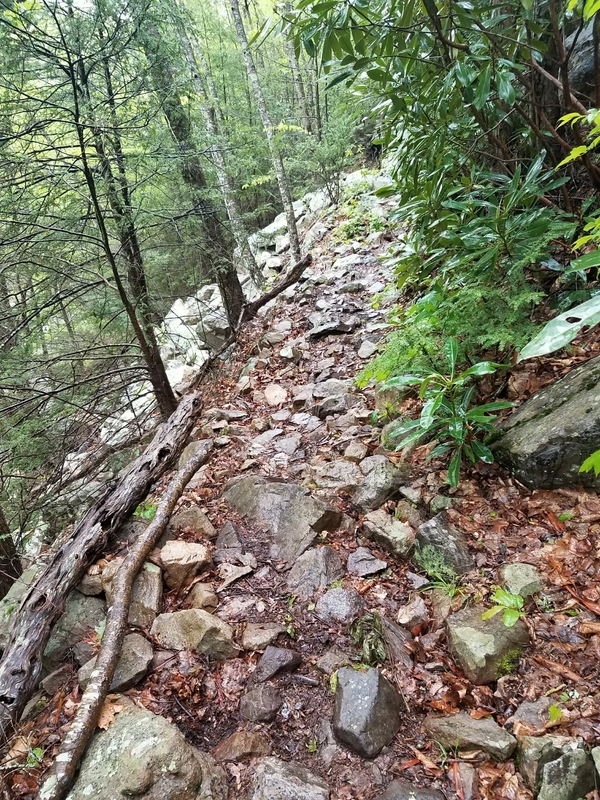 When I had sat down with the REI shoe guy, we both were under the impression the rocks didn’t start until Pennsylvania, which is famously rocky, and that the Speedcrosses would be fine until then. Turns out all of the AT has rocks and Pennsylvania is just rockier, which would have been a helpful distinction to have understood before I got here. Anyway, I decided to change shoes in Damascus. I switched to a pair of Salomon XA Pro 3D’s. Sturdier and would handle the rocks better. About 30 miles after Damascus I had decided they were demons. They came up higher than my Speedcrosses and the ankles were so stiff and new that now my ankles were swollen and bruised every night (my feet were doing great though). I am hopeful it’s an issue that will be resolved as the shoes get more broken in, but it’s made for a really painful 60-ish miles. Pain has sort of been the epicenter of the last few days. I’ve had some aches that come with walking all day everyday with your whole life strapped to your back, but I’d been pretty lucky to avoid anything I had to actually stop and think about. Do I push through and wait for the shoes to break in? Will that make it worse? My ankle is swelling. Should I slow down and wait for the shoes to break in? How long do shoes take to break in? What if it’s a bad shoe? How will I get a new one? What’s a good shoe? Can I call Salomon and list all my issues and have them magically tell me over the phone what a good shoe is? At various points the last couple of days I’ve considered both hiking in my crocs and cutting the ankle off of a very expensive pair of new shoes, which should hopefully illustrate my level of desperation. They had. Then they hurt more in the middle. And they hurt the most at the moment. I jokingly gloss over the myriad of things happening to my feet every week (my trench foot is better, thanks for asking), but in truth they are going through some kind of grotesque things. I don’t really know what portion of my foot pain is inevitable (I know you can’t walk over 2000 miles without your feet hurting) and what is avoidable, so I’m just sort of bumbling along, trying to fix the obvious fires while apparently starting new ones. Currently they are hurting quite a bit. Again, neither a high nor low, really. 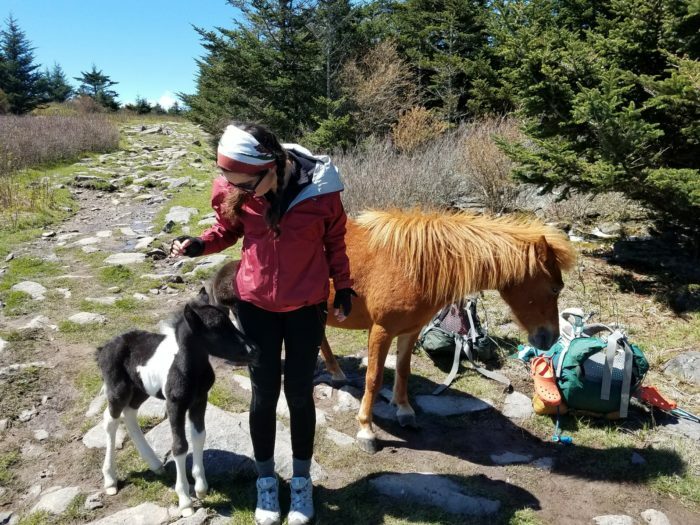 For those unfamiliar, the Grayson Highlands are famous for their wild ponies, which are super adorable and probably one of the most Instagram-able AT moments. I had my highly entertaining interaction with them and then returned to hiking and contemplating my shoes. I got to camp and saw a lot of familiar faces I hadn’t seen since my mom had joined me, including my friend Cantaloupe, who I chatted with while I hung my ursack. The next morning, I woke up and laid in my tent for awhile, procrastinating putting on my shoes as long as possible. I heard footsteps outside my tent. “Gandalf? I have some news,” Cantaloupe’s voice informed me. Cantaloupe responded with a long draw out “umm” that suggested this was news he had planned to deliver visually. I rummaged around for my pants. “Well, I got your food bag,” he said finally. “Oh thanks!” I said brightly, always glad not to have to make the trek to my food in the morning. I’d found my pants. “WHAT? 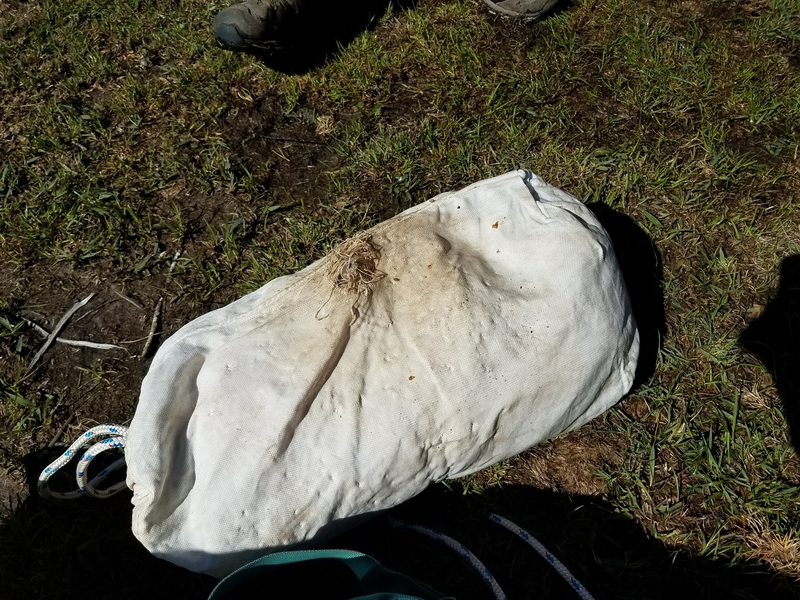 !” I finally jammed both legs into my pants and rolled out of my tent to the sight of one giant hole in my food bag. Cantaloupe gingerly handed it to me along with a handful of empty, chewed up Ziploc bags. It was soggy with pony drool. Turns out the pony bandit had hit a couple of ursacks in the night including Cantaloupe’s, who’d had his untied and dragged into the woods. He’d searched out the fate of mine after seeing to his. These bags are advertised as being bulletproof, which really signifies the resolve of the Greyson Highland ponies. We went through my food. I was missing some whoopie pies, cheese, and a bag of cereal. Everything else was crushed up or chewed up and a lot was covered with soggy whoopie pie, and I played a game of what-am-I-willing-to-eat? Turns out not enough to get me to my originally planned resupply point and I made plans to stop in Marion, which was probably for the best given my ever-swelling ankle. 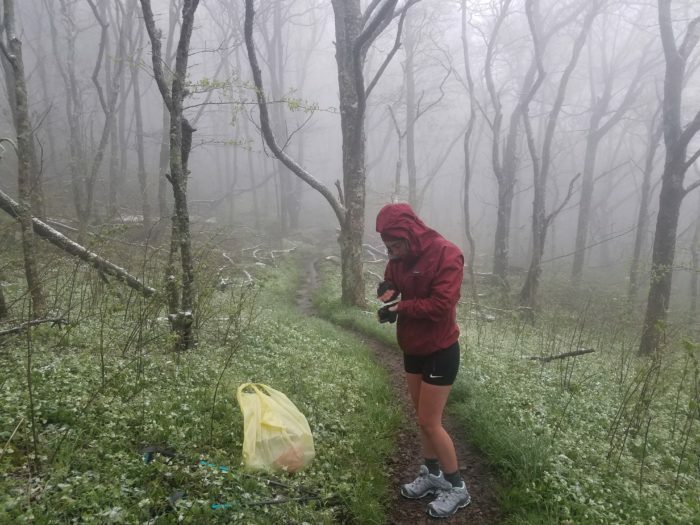 For all that it was mildly annoying, it’s going to be a great shelter story for weeks and it has illustrated how easily I navigate unforeseen circumstances on the trail now compared to the beginning, when I would have had a complete meltdown over losing my food. It’s been a good week of mama time and entertaining pony anecdotes. I give it 8 out of 10 fudge stripe cookies. I enjoy reading your updates Becky! Love the pony pics! Maybe one day I’ll go to the Highlands with Doc Iowa just for the ponies! I’ve used my Ursac on the Trail for 6,000 miles and the only thing that chewed through was a squirrel in northern Maine. 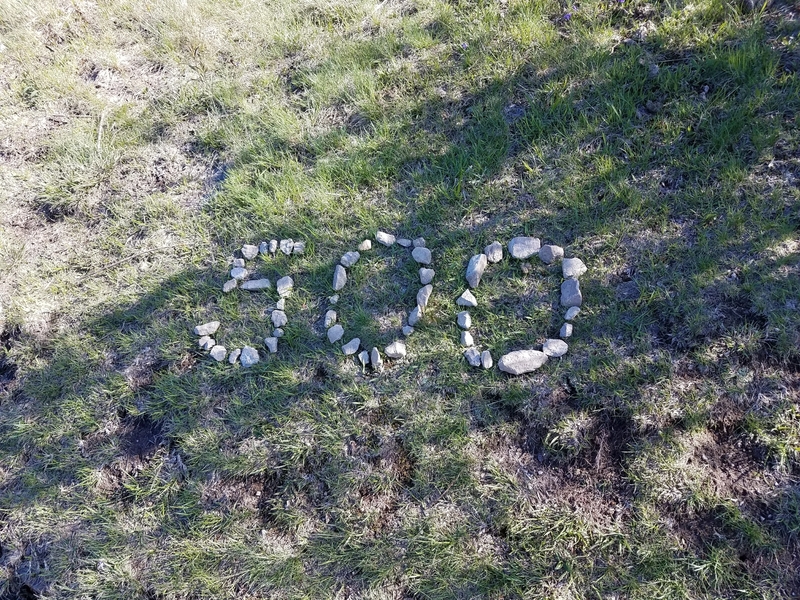 (I had hiked way past the ponies before camping). I repaired my Ursac by turning it inside out and sewing the hole shut with kevlar fly tying thread. If you want some mailed to you, e-mail me. 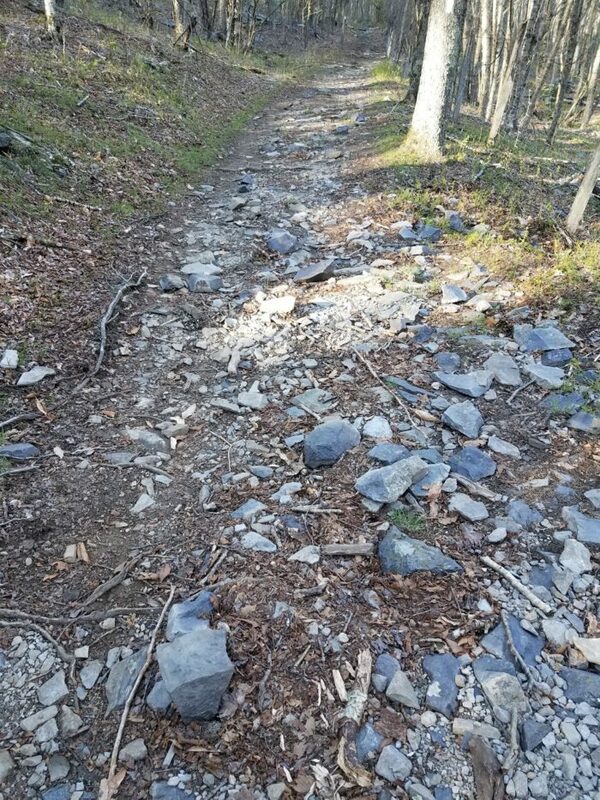 I also had problems with new higher top shoes and walked most of the Shenandoahs in my Crocs. Eventually bit the bullet and cut the boots down with a box cutter. The lessons of the Trail.